Last week, as I write this, I moved from a rambling old farmhouse with a barn into a tiny apartment in the city. I spent weeks selling, donating and giving away many of my belongings—furniture, clothing, sports equipment—finding new homes for all my stuff before I moved into mine. While virtually everything about my life right now is new and a little strange, a few things remain constant. There’s a vintage lamp that made its first appearance in my college dorm room, a pair of barrel chairs crafted by a Maine woodworker more than 25 years ago and rugs that are a little worse for wear but have a beauty that only years can impart. Virtually everything I brought with me has significance. As Kondō would say, they spark joy. My new little kitchen was the last piece of the puzzle to fall into place. When my stove was finally hooked up, I christened the space by preparing one of my favorite comfort food dishes, pad thai. When life is uncertain, when I’m feeling at loose ends, sometimes a warm, familiar meal is the best way to set things right. I am a pad thai connoisseur. I’ve had pad thai in Texas and in Thailand and many points in between. I’ve had the good, the bad and the divine versions. But my make-at-home version will always be my No. 1. This recipe has gotten me through the best and worst of times. It is, by all standards, a top-notch comfort food, with complex flavors, bright colors and hearty, filling noodles. It can be customized with different proteins—my go-to is shrimp, but lobster is lovely, too—varying degrees of heat and the veggies you have on hand. It takes minimal preparation and comes together in minutes. So when it feels like a take-out kind of night, get comfy and cook at home. Prepare rice noodles according to package directions. Most require soaking, others boiling. Drain well. Heat 1 tablespoon of oil in large sauté pan or wok and cook garlic and veggies for about 1 minute, just until the veggies are softened a bit. Do not overcook. Set aside veggies and wipe out the pan. Whisk soy sauce, lime juice, brown sugar, fish sauce and red pepper flakes in a bowl. Add 1 tablespoon of oil in the sauté pan over medium-high heat. Add noodles to the hot pan and toss to coat with oil. Add the sauce to the noodles, tossing to coat well. Push the noodles to the edges of the pan and pour in beaten eggs. The eggs will set on the bottom in about a half a minute with the top still runny. Toss the noodles into the runny egg. The noodles will get a glossy coating and tasty bits of cooked egg will make their way throughout. Toss in cooked veggies and protein, making sure all the ingredients are heated through but not overcooked. Garnish with green onions, cilantro, and peanuts. Rice noodles make this dish authentic, but if you can’t find rice noodles, you can use a flat pasta noodle like linguini, cooked al dente. 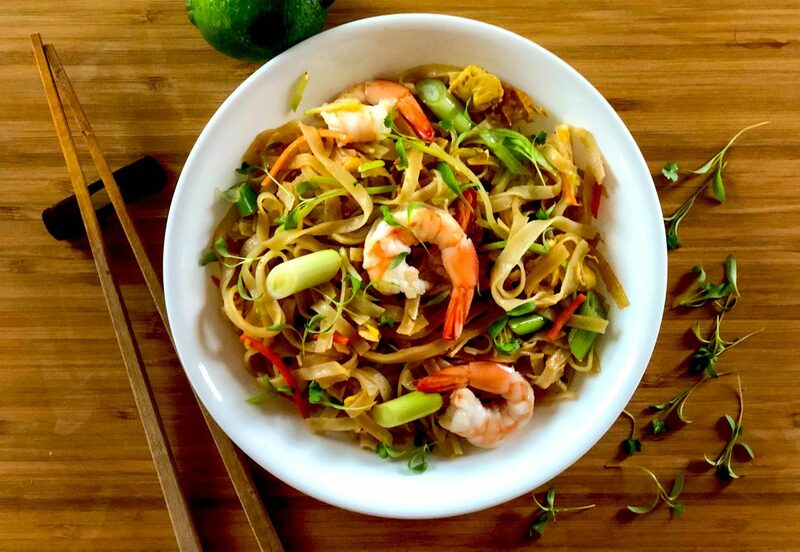 Pad thai makes a wonderful vegetarian meal that is satisfying and flavorful. Just add tofu as protein—or for you tofu haters, skip that and double up on the vegetables. Make juicing your limes easier by popping them in the microwave for 15–20 seconds. Make sure the lime is cooled before you juice.